Swag Surf in danger of being Columbused by big-time college football? Is major college football about to “Columbus” the Swag Surf? Truthfully, I should have known this moment would come. Now it is here and I am totally unprepared for it. A 21st century HBCU tradition has found its way to officially packaged marketing videos by powerhouse athletic programs who cut the checks in money games instead of collecting them. Yes, ladies and gentleman, the Swag Surf appears to have gone mainstream. First it made a cameo in a video Ohio State football tweeted out on Monday as a few shirtless players locked arms for a moment of solidarity. But Texas took it even further on Friday, when head coach Tom Herman tweeted a melanin-rich 33 second hype video of his players, as well as a few cheerleaders and fans dancing during practice. And I don’t know how to feel about it. Swag Surfin’ was born my final year of college, 2008-2009. That’s when Fast Life Youngstaz dropped the song as its debut single. The lyrical content is not that memorable. I couldn’t even tell you five words outside of the hook. If I saw a member of FLY, I wouldn’t know who they were. But the dance that accompanies it “the swag surf” has become a crowd favorite around the HBCU world since it dropped eight years ago. It’s cool to do it by yourself (and pretty easy to do), but when you are in a crowd — it’s magic. I’ve been to games at HBCUs from D.C. to Baton Rouge and its the same all over. As soon as those first couple chords hit, it’s a wrap. 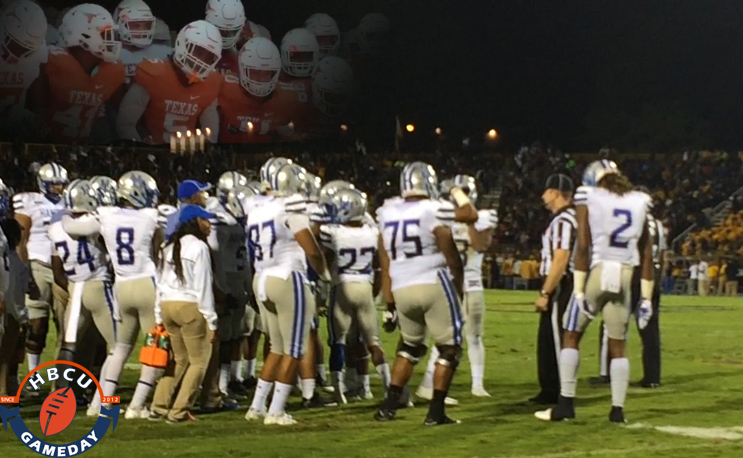 If you’ve been to an HBCU game at any time during the last…four or five years, you’ve at least seen a large group of students or young alumni doing it, and maybe even done it yourself. Countless videos of hundreds, maybe thousands, of folks locked arm-in-arm swaying have gone viral. Last season we even caught Hampton’s players doing the Swag Surf during a TV time out at Aggie Stadium when they played North Carolina A&T on a Thursday night. Until now, it’s been mostly an HBCU thing, especially in the sports world. But the young men who are now playing in the Big Ten, SEC and every other big-time conference have grown up watching those videos and like their talents, it is impossible to keep it under wraps. HBCUs have made the Swag Surf a part of millenial Black culture, and so it was only a matter of time before the rest of the world caught on. Still it is definitely a little odd to see the dance being used as a marketing tool by a school that is culturally about as far from being an HBCU as you can get (at least, off the field) as The University of Texas at Austin is just 3.9 percent Black, according to its Fall 2015 Student Profile. Is it that serious? It’s just a dance right? Yes, and no. HBCUs don’t hold any patents on the Swag Surf, but it is definitely a part of HBCU culture that until now has been unique. The Swag Surf at Doak Campbell Stadium (Florida State) will definitely look different than it does at Bragg Stadium (FAMU). Once again, HBCU culture is being adopted outside of our world. Just don’t forget who “had that swag” first. Queen City BOTB adds famed SWAC band, but will crowd come without A&T?